You are here: Home » GENRE » Computers » U.S. Government wants a super-big super-computer. U.S. Government wants a super-big super-computer. Intel, Cray, the U.S. Department of Energy are to deliver the first supercomputer with a performance of one exaFLOP in the United States. The system being developed at DOE’s Argonne National Laboratory in Chicago, named “Aurora,” will be used to advance scientific research. The contract is valued at $500 million and will be delivered to Argonne National Laboratory in 2021. The Aurora system’s exaFLOP of performance – equal to a quintillion floating point computations per second – combined with an ability to handle both traditional high-performance computing and artificial intelligence will give researchers a set of tools to address research projects ranging from developing extreme-scale cosmological simulations, discovering new approaches for drug response prediction, and discovering materials for the creation of more efficient organic solar cells. 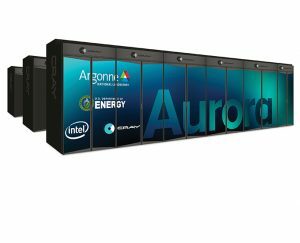 Aurora will use Cray’s next-generation supercomputer system, code-named Shasta, which will comprise more than 200 cabinets and include Cray’s Slingshot high-performance scalable interconnect and the Shasta software stack optimised for Intel architecture. Chappie . . . Five’s alive! If there’s a Doctor Charles Forbin involved, I’d get a bit worried. « Call of Cthulhu must burn! China orders printers to incinerate RPG game.